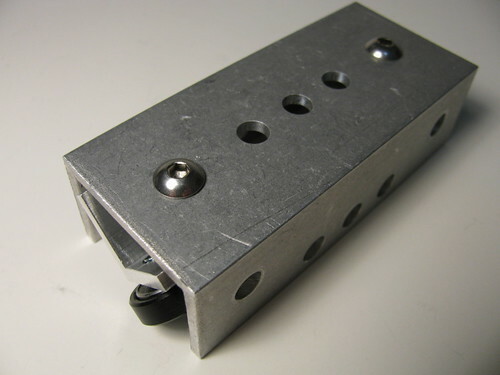 Linear bearing is made from aluminum channel (or part of rectangular/square tube), aluminum angle, bearings, shims, fasteners and Delrin rings. 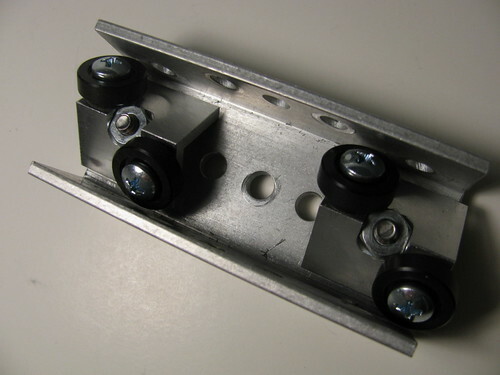 Like the sliding element, it consists of 1½" long mounting section(s) and 1" long bearing section(s). 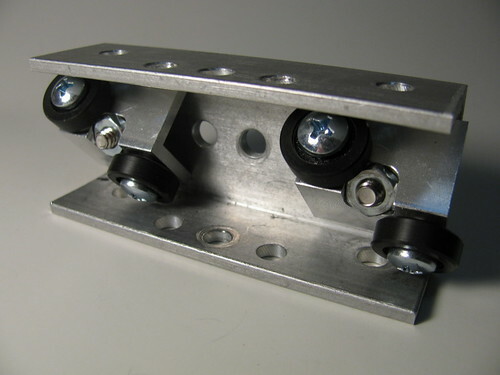 The bearing section consists of pair of wheels (bearing+ring) mounted on the angular wheel mount attached to the channel by a screw. 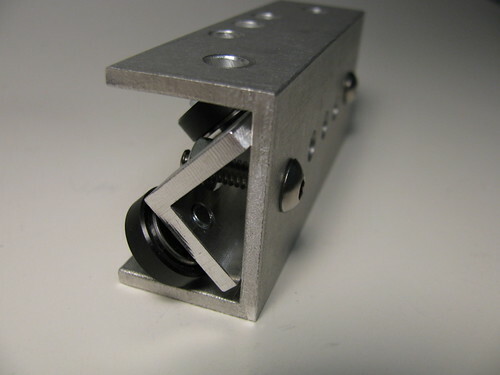 The mounting section has a pattern of holes on each side of the tube to mount perforated angle. Many cheap R3 bearings seem to have inner diameter a bit less than 3/16" (by 0.005" or sometimes even more), so it's recommended to use regular zinc plated steel screws (3/8" length) since their OD is also a bit less. 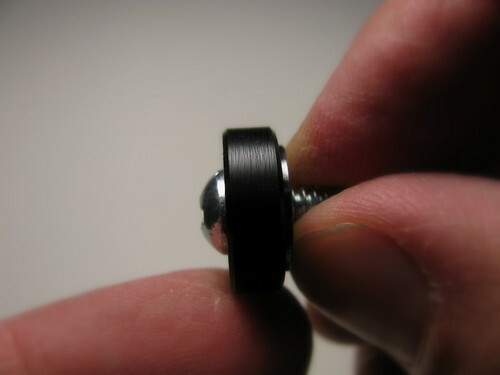 For example, stainless steel screws may not fit in the R3 bearing. 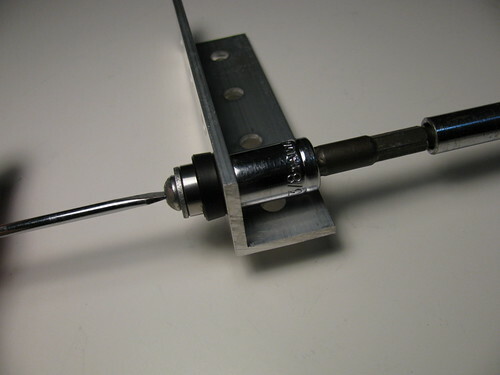 To make the angular wheel mount, you will need transfer punch set (such as this this) and 10-24 tap in addition to the tools specified in Tools section. Make the channel piece from SVG templates, according to the instructions in Howto section. Make the angular wheel mount from SVG templates, according to the instructions in Howto section. To mark the wheel mounting holes in the angle, use 3/8" dia transfer punch and press it against the inner wall of the angle when punching. 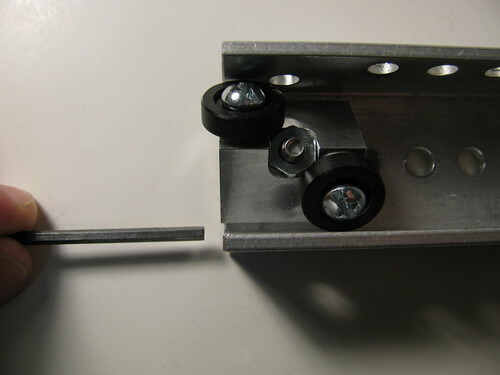 This will ensure that the holes are accurate, resulting in good alignment of the wheels. 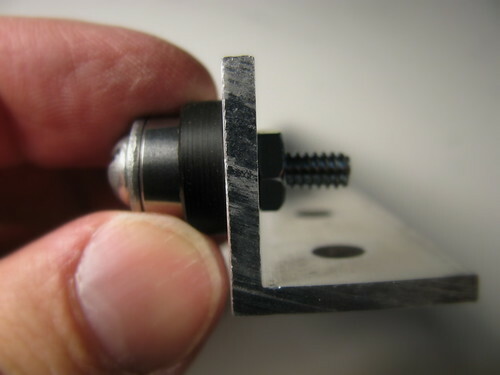 The DIY version does not have a center slot - instead, a hole is drilled through the center of the angle and tapped 10-24. 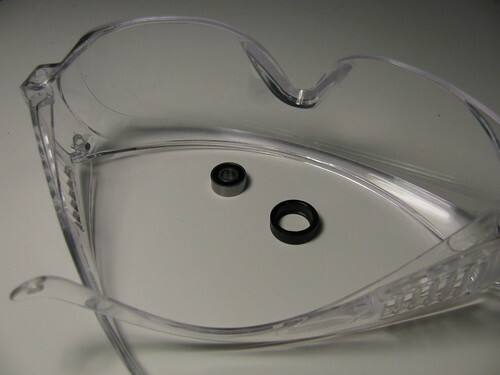 Pre-fabricated rings will be available for purchase separately from a kit. 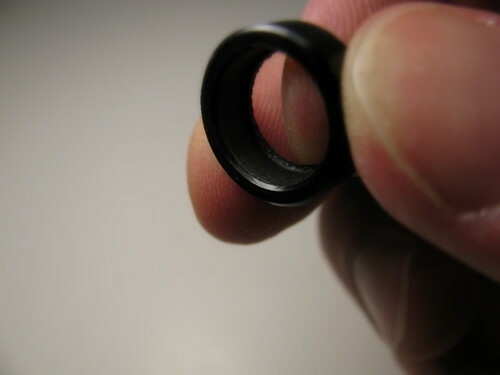 One edge of the Delrin ring has an inner lip. Chamfer the opposite edge of the ring (inner circumference) with a hobby knife. 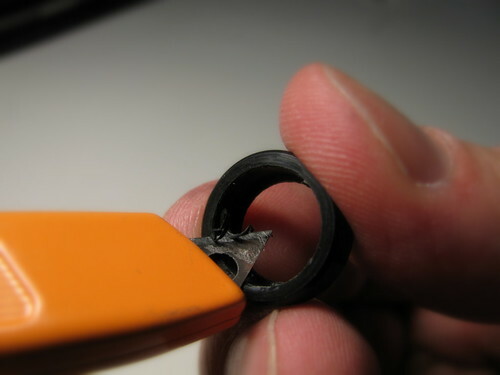 Make sure the inside of the ring is clean from Delrin swarf. 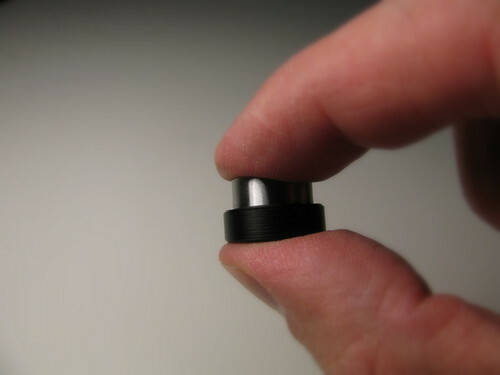 The bearings should be press fit into Delrin rings. 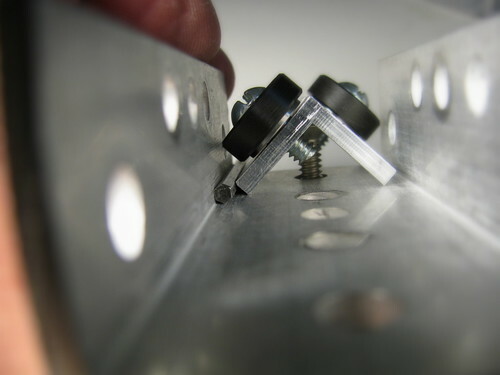 Press fitting should preferably be done with a vise, however it can also be done without it. Wear eye protection for this step! 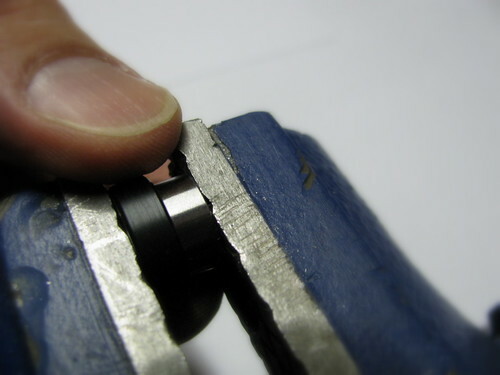 Place the bearing on the chamfered edge of the ring but do not allow one side of the bearing to "fall" into the ring. Hold both ring and the bearing by the rim with two fingers. 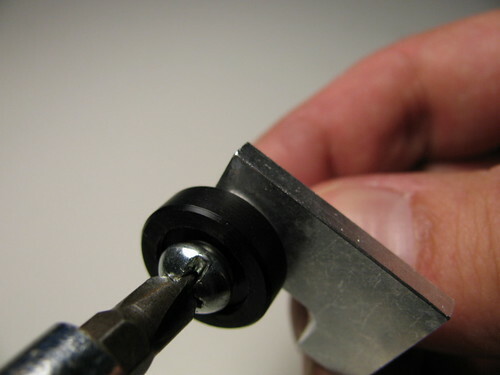 Position the ring with the bearing between vise jaws and start closing the jaws slowly. 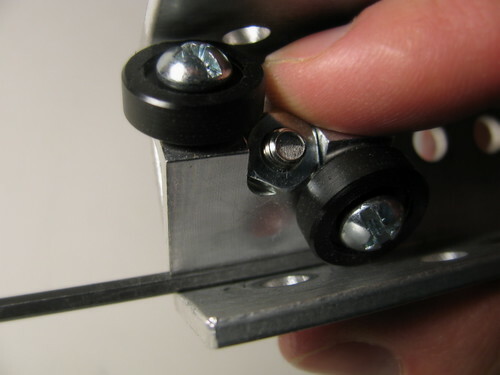 Place washer and bearing on 1" screw; place the ring (lip down) on the outer side of a Contraptor angle over a hole. 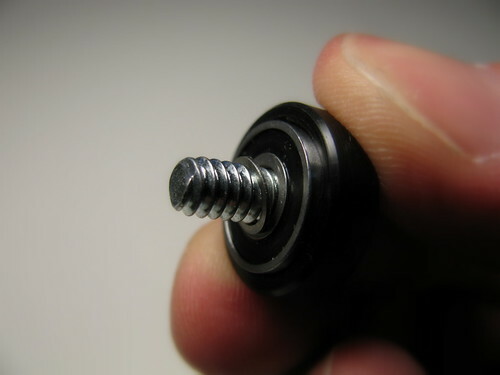 Put the screw with washer and bearing on top of the ring and put a nut on the screw from the other side. 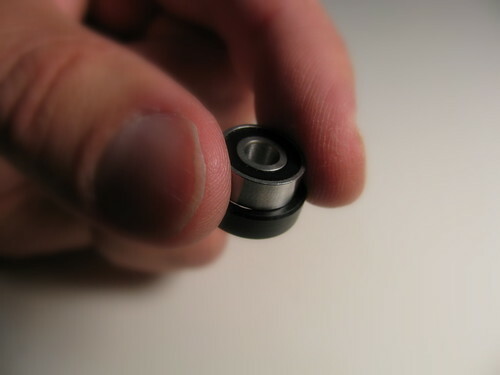 Finger-tighten the nut and center washer+bearing over the ring. 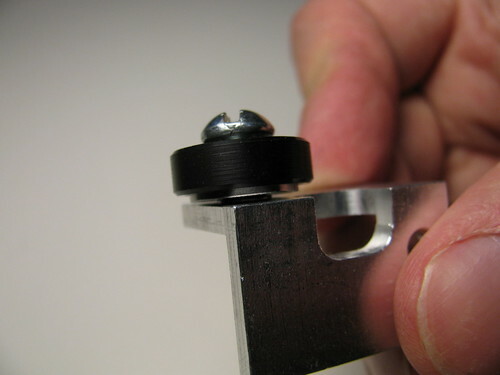 Tighten the nut with a hex socket until the bearing is almost entirely inside the ring (lip thickness will determine how far it will go). 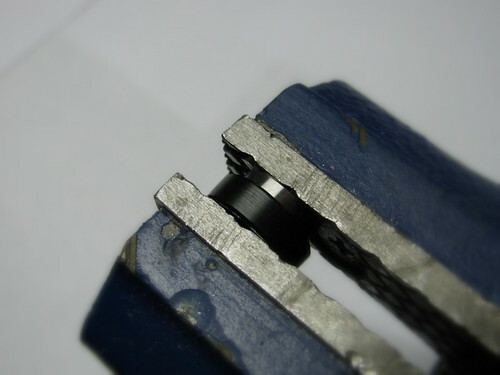 If the bearing tilts in one direction too much, it will get stuck and you can damage the ring if you continue tightening further. In this case, add more chamfer to the inner circumference of the ring (step 1) and repeat. Repeat press fitting for all R3 bearings. 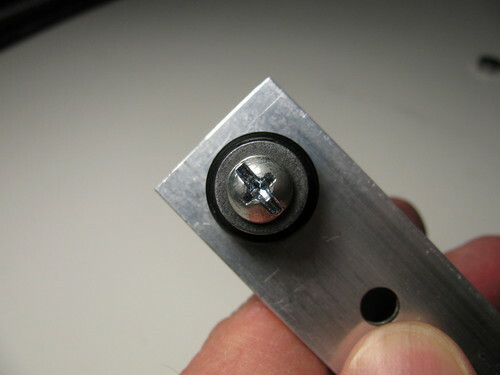 Put assembled bearing wheel on 3/8" screw, wheel lip on the same side as the screw head. Rotate the wheel to visually verify that it is not eccentric. 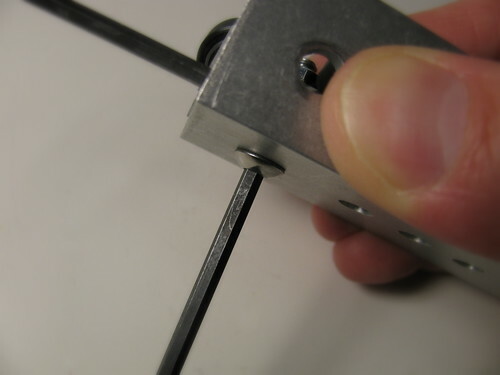 Tighten the screw using a hex key or screwdriver. Repeat for all bearing wheels and angular wheel mounts. 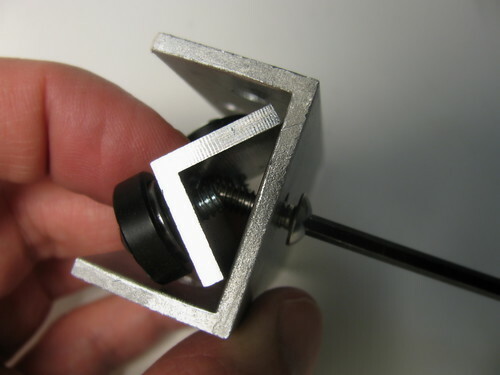 Install the hex nut into the opening of the angular wheel mount. 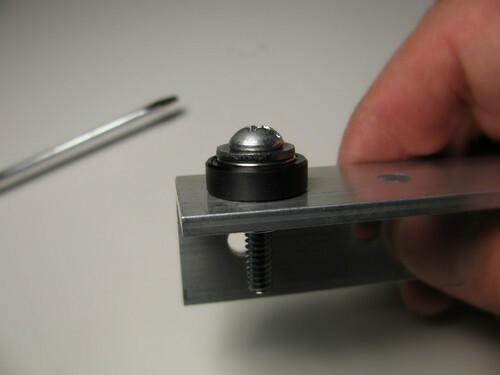 Attach the wheel mount to the bearing section of the channel piece with a 3/4" screw. 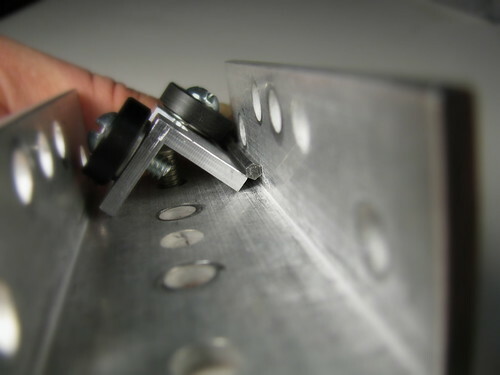 To align the angular wheel mount, insert the long arm of 7/64" hex key between the wheel mount edge and the channel wall, so that one of the faces of the key is flat against the wheel mount edge. Slightly push the wheel mount to hold the key in place and tighten the 3/4" screw. Do not over-tighten as this may excessively bend the channel piece. Remove the hex key. 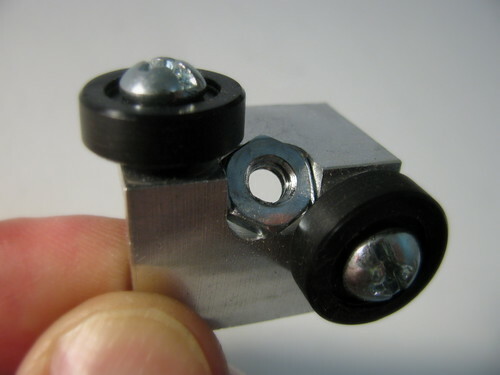 If it's difficult to remove, you may have pushed too hard on the angular wheel mount. Because the wheel mount assembly is not perfectly centered on the channel piece, mark the inside of the wall where you used the hex key with a Sharpie. 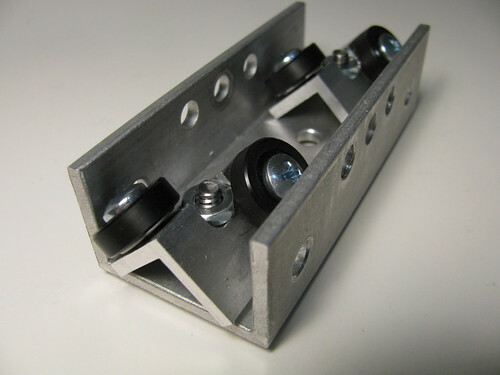 This will help to correctly orient bearings in the assemblies. Repeat this process for all bearing sections/wheel mounts.